1.1996 NACD Blue Ribbon Commission Report on Director Professionalism — This was a very influential report covering recommended roles and responsibilities of the Board. It included strong recommendations to pay Directors via cash and equity and to dismantle Director pension and benefits programs because they created too much alignment with the existing senior management team. It was also an early proponent of having an independent Director in charge of certain Board activities, eventually leading to the rise in prevalence of Lead Director roles. 2. Sarbanes Oxley (SOX) — SOX, effective in 2002, came out on the heels of the Enron scandal and multiple stock option “back-dating” scandals. It reframed the Board’s responsibilities and included an expanded role for its Audit Committee. 4. Recent Focus on Board Replenishment — Especially in the past 5 years, there has been increasing shareholder and governance organization focus on Board replenishment with the idea that more frequent Director changeovers could promote enhanced diversity, add new ideas and specialties, and potentially benefit Director independence. 5. Separation of CEO and Board Chair — Over the past 20 years, corporate governance organizations and some shareholder activists have pushed for the separation of the Chair and the CEO roles. In the past, most U.S. companies had CEOs in both roles; this is different from typical practice in other countries such as the U.K., where the roles are separate. 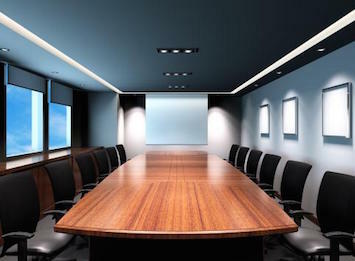 There has been a significant uptick in separate Chairs recently (44% of the S&P 500, up from 21% in 2001).2 While many companies have not separated the 2 functions, there has been a rise in the independent Lead Director role to ensure that certain Board activities are handled by an outside Board member rather than the CEO in those cases. 6. Dodd-Frank Regulation — One of the early regulations implemented under Dodd-Frank was to have an advisory SOP vote by shareholders so they could voice their support (or lack thereof) of executive compensation programs. The first votes took place in 2011. Director pay levels tend to be very closely clustered together, unlike the wider distribution of executive pay. For example, the 25th percentile of total compensation for the S&P 500 sample is $230,000, and the 75th percentile is $295,000 compared to a median of $260,000. This means the vast majority of S&P 500 companies pay Directors within $35,000 of the median (a relatively narrow range of ±15%). Because Director pay data is so tightly clustered, it is useful to consider dollar variance values from the median — not just percentile ranking — when considering pay competitiveness. A recent litigation decision has further reinforced the importance of having a clear process for making Director pay decisions — including having specific Director equity grant limits— in place to reduce exposure to lawsuits on Director pay. This topic garnered much attention after a recent Delaware Chancery Court ruling (Calma vs Templeton): the Court refused to apply the business judgment rule to dismiss claims against Directors who received large restricted stock awards. - providing expanded disclosure of the pay-setting process in the annual proxy. ‍Perquisites — While many of the larger Director perquisite programs have been eliminated, certain programs are still used by some companies, including product discounts, charitable contribution matches, and spousal travel reimbursement for certain Board events. Given the current environment, it is likely that there will be continued pressure to reduce Director perquisites. ‍Executive Chair Pay For Former CEOs — As part of the succession planning process at some companies, the retiring CEO becomes Executive Chair for a few years. Compensation packages for these Executive Chairs range widely and in some cases can be as much or more than the new CEO’s. 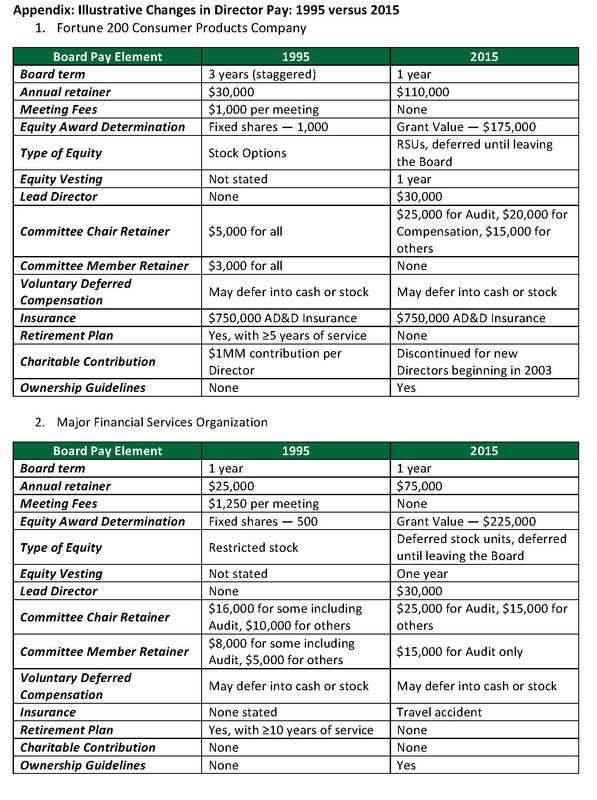 While continuity and smooth succession are important, we believe shareholder activists and proxy advisors may start paying more attention to the size of Executive Chair packages for former CEOs, particularly if such legacy pay levels continue for ≥1 year after retirement and do not correspond well to the level of effort exhibited by the incumbent. ‍Lead Director Pay — When the Lead Director role began, it often was unpaid. As the role has evolved, compensation is now commonly just above the level of retainer provided for the Audit Committee Chair. As this role takes on more prominence and demands more time, we expect Lead Director pay will exceed Committee Chair pay by a more significant margin. 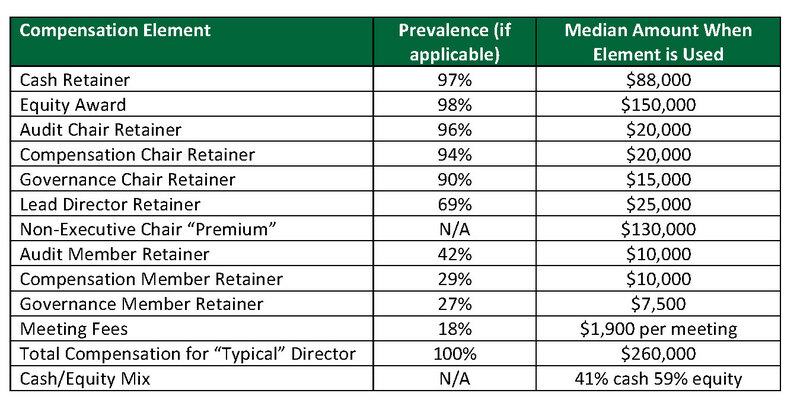 ‍Relationship of Pay Premiums for Non-Executive Chairs versus Lead Directors — Non-executive chair pay continues to be substantially higher than Lead Director pay: based on the S&P 500 data shown earlier, a Non-Executive Chair is paid about $100,000 more for the role. This pay gap between the 2 roles may be based on valid differences in role and responsibilities. However, it is not always clear to outside stakeholders what the exact roles are. As most large companies have 1 of these 2 roles in place, we expect more discussion in the future on what the premium should be for each of the 2 roles. As noted above, we believe Lead Director pay will increase, closing some of this gap. 1. Re-Jin Guo, et al. “Director Notes: Activism and the Move Towards Annual Director Elections.” The Conference Board. December 2011. https://www.conference-board.org/retrievefile.cfm?filename=TCB-DN-V3N24-11.pdf&type=subsite. 2. Charles A. Tribbett, III. “Splitting the CEO and Chairman Roles - Yes Or No?” Russell Reynolds Associates, Directors and Boards. December 1, 2012. http://www.russellreynolds.com/newsroom/splitting-the-ceo-and-chairman-roles-yes-or-no. 3. S&P 500 director compensation data provided using Kenexa.